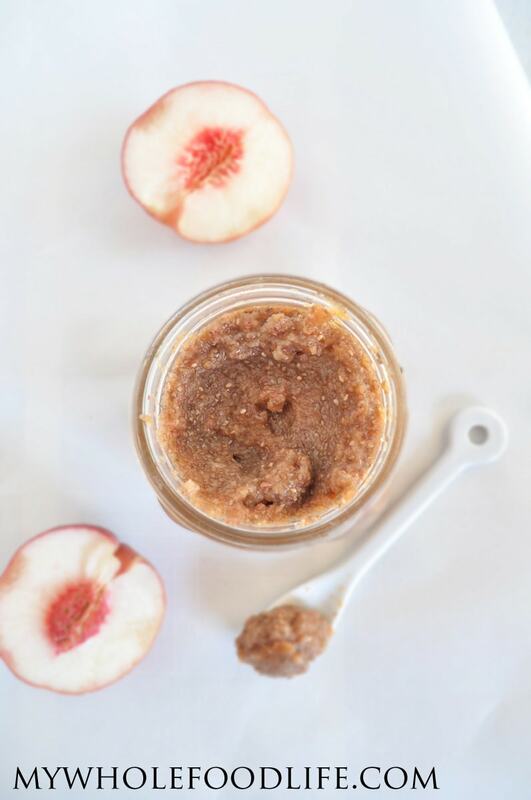 Peach Chia Jam. I made you a chia jam! Are you seeing the peaches show up at your grocery store? We are well into summer here in Texas, so I thought I would make some peach chia jam. It turned out so good. The best thing about this peach chia jam, is that there is no canning, boiling or pectin involved! The chia seeds do all the work. This chia jam is made in the refrigerator. Super easy! Another great thing about this jam is that it contains no added sugars. Peaches are so sweet on their own, so I didn’t feel the need to add anything extra. However, if you like things a little sweeter, you can probably add a couple teaspoons of maple syrup or raw honey. This jam needs to be stored in the fridge and it should last a couple weeks. It’s great on toast, on top of yogurt, or even as a pancake topping! Only a few ingredients to make this healthy jam! Slice the peaches and blend them up in a food processor . I left the skins on, but you can peel them if you like. Once the mixture is smooth, add the chia seeds and place the mixture in the fridge for about 3-4 hours to set. By the time we get home (to Texas), where my food processor is, peaches will be long gone. So I'm saving this recipe to definitely make next year - or it just occurred to me that I could use frozen unsweetened peaches. This is the kind of recipe I love because it is sugar free (with no artificial sweeteners) and it is simple. I could easily see it mixed with Greek yogurt for a snack, or atop pancakes… Yum!! I have been very frustrated with the supposedly natural jams in the grocery stores, because apparently food manufacturers don't believe that fruit is sweet enough on its own. This is a great way to have whatever flavor of jam I want. It brings jam back into my diet. And for that I am grateful. I agree most store bought jams are less than ideal. Peaches are so sweet on their own, I never felt the need to add an extra sweetener. This recipe works with just about any fruit too. I could see it being really yummy with apples too. we just brought home a ton of peaches from Vermont - such a simple, great way to use them! Love the recipe!! I love chia pudding but it's nice to have another recipe to put them in, plus I love peaches!! Thanks for all your great ideas!! Thanks! Yes I think it would work, but you may need to add some sweetener to offset the tartness of the lemons or limes. how long will this last in the fridge? thanks! A couple weeks. You can also freeze it. Love how simple this is - I tried making gooseberry jam the other day but it didnt set and this looks like a much simpler option! This looks so easy and yummy! I don't have peaches but will strawberries work? If so how many? Thanks! What is CHAI? and where do I get it? I know you told someone they could freeze the jam, I'm just wondering if you have ever froze it before? Also if the results of freezing it turned out well? I have frozen it with good results.